It is already almost a decade since Internet banking services first sprang up en masse. Consumer and corporate use of the medium to manage accounts and conduct transactions continues to grow—though not quite as fast as during the early days. 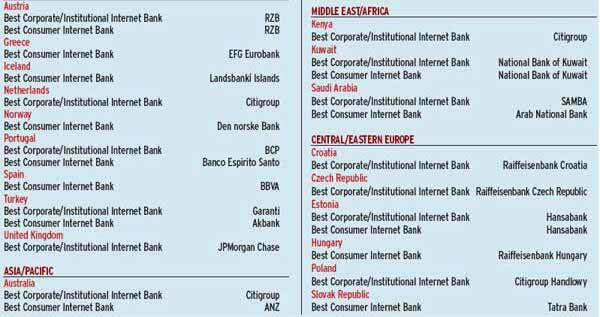 As it matures,the global Internet banking market is beginning to show some clear trends. Although Internet penetration growth rates remain steady,“rates of adoption for online banking continue to increase in many markets, especially emerging markets.Outside events, such as [political or] market shocks, can spur even faster growth,” says Benton Moyer, with the global consulting firm Neoris. One example Moyer points to is the outbreak of SARS in Asia,which caused an overall increase in online usage, as people were afraid to step out in public, and also boosted online banking.And during Argentina’s financial crisis, many banks boosted services online in order to provide an alternative to waiting in daylong lines to withdraw money. Increasing regulatory and media attention on privacy, identity theft and cyber terrorism is prompting banks to beef up their security systems and privacy policies. In Latin America, for example, the latest round of new, customized Internet offerings for corporate/institutional bank customers has arrived in tandem with banks upgrading their security platforms, online banking consultants say. Corporate clients are clamoring for online services that go beyond account information and transactions and ac-tually change business processes to make them more ef-ficient. They increasingly seek online offerings, such as workflow management processing solutions, that pre-sent them with a fundamentally better way of operating. They also want services that improve previously ineffi-cient business processes—foreign exchange, payments and trade settlement,for example—saving them time and money. Providing these services allows banks to leverage the Internet to strengthen their relationships with im-portant corporate customers and keep them from switching to a competitor, say consultants. Internet banking has made the most headway and is reaching critical mass among corporate and institutional customers in cash management. For example, leading banks report usage rates topping 70% or 80% for cash management offerings. The banks have spent a lot of money to get these services right and to please demand-ing corporate clients. Strong cash management offerings allow a treasurer to check a balance, see if a payment is missing, initiate the payment and get a confirmation in one click on one screen. Customization allows corporate users to tailor their cash-management-reporting template to be on alert for certain balance thresholds and to exe-cute transactions automatically. Straight-through process-ing (STP) is also starting to gather steam.STP is the seam-less electronic processing of trades—be they FX, fixed-income or equity—from order entry to routing and execution. Corporate clients are increasingly demanding STP trading solutions to help reduce costs and enhance return on investment by executing and clearing transac-tions more quickly. What many of the best Web offerings have in com-mon is that they are well organized, integrated and consistent; save time and money for clients, as well as the banks themselves; and foster customer loyalty. Successful online banks also use the medium to get their clients to buy as many as five products or ser-vices from them instead of the two or three that is commonplace. Winners were chosen from entries evaluated by a word-class judging panel comprised of representatives from the consulting firms Bearing Point, Deloitte & Touche, Logica, Neoris and Tata Infotech. 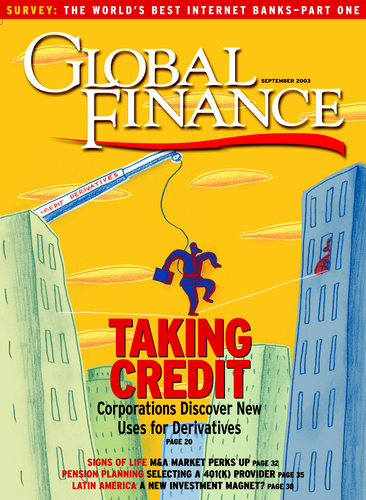 Global Finance editors were responsible for final selection of winners and in the first round made 65 country-level awards to banks in 46 different countries and 50 awards for regional winners in 10 functional sub-categories. 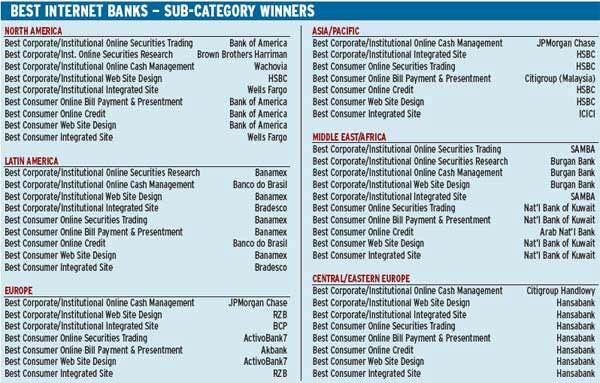 A number of banks won multiple awards, including Banamex, Bank of America, Citigroup, Hansabank, SAMBA and Wells Fargo. 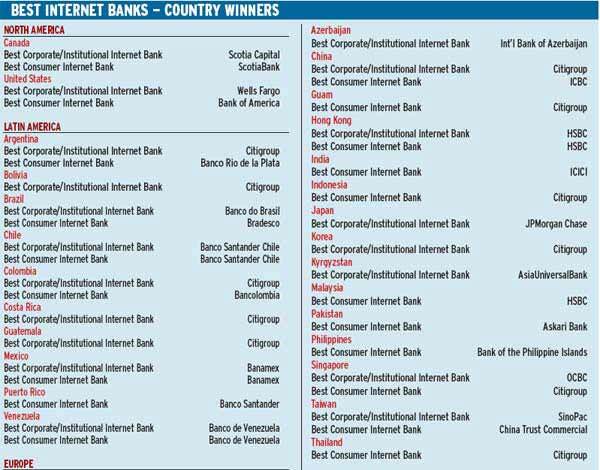 Awards for Regional and Global Best Corporate/Institutional Internet Banks and Best Consumer Internet Banks as well as Global sub-category winners will be made at an October 16 awards ceremony in New York and published in the December issue of the magazine.